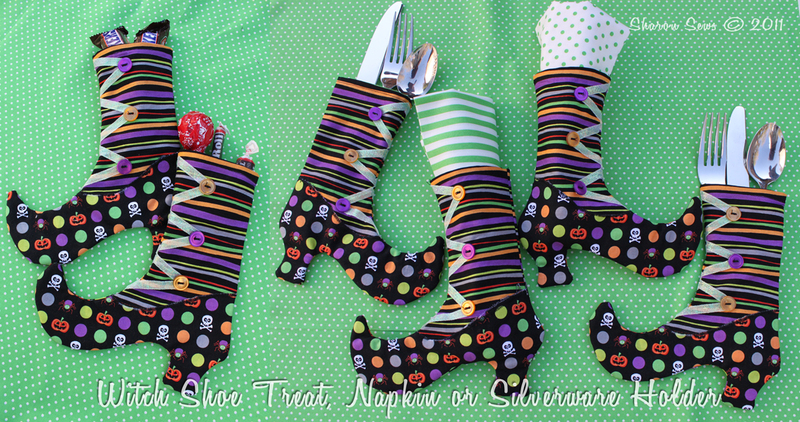 Sew yourself a set of Witch Stocking and Shoe Silverware holders - or use them as mini treat bags. Download the free Witch Shoe/Stocking template here. It will open up in Google docs. To print it choose File (located on the upper left side of your screen) and choose print. 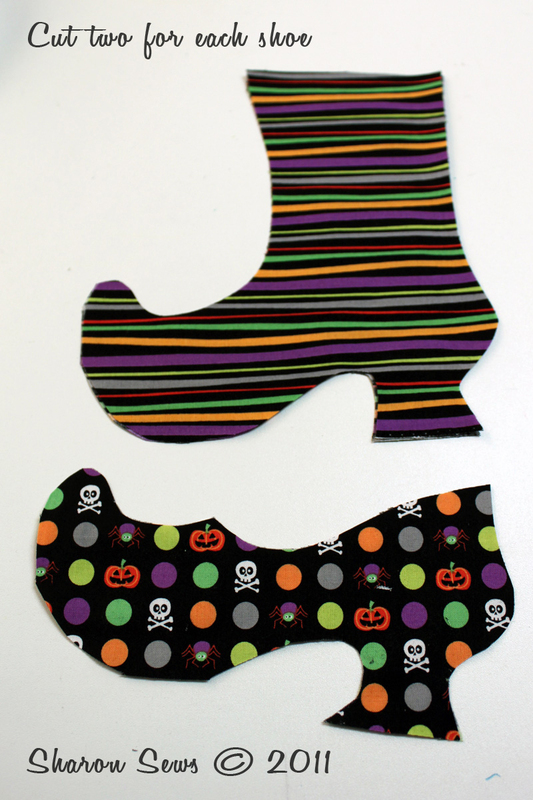 For each shoe cut out 2 of the stocking (which will be the full template shown in the striped fabric) and 2 of the shoe (which will be the bottom portion of the template shown in the polka dot fabric). 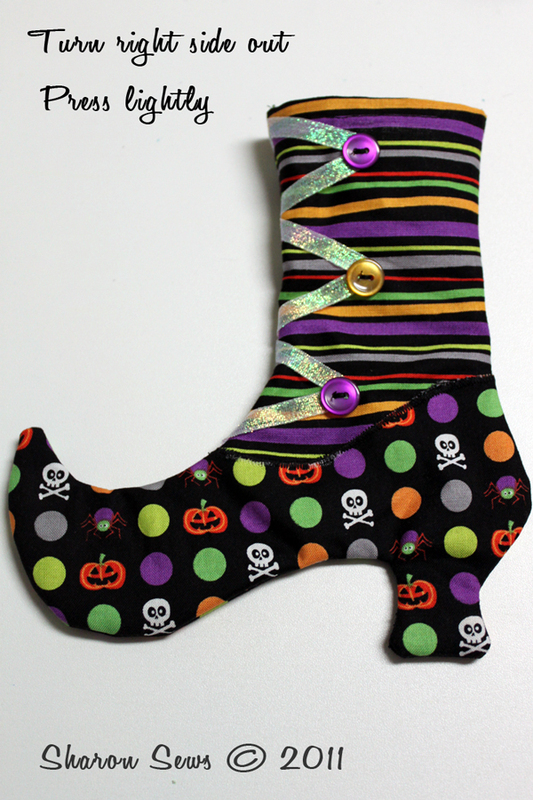 Pin the shoe portion on top of the stocking as shown. 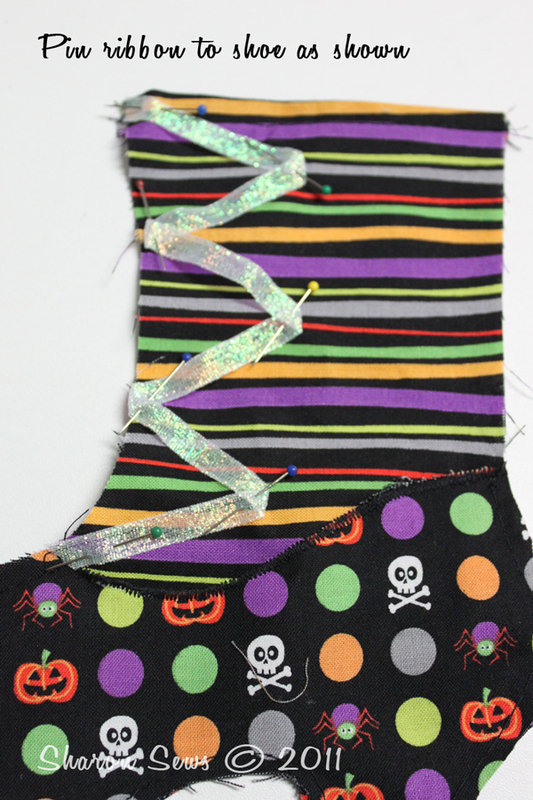 Using a narrow zig-zag, stitch along the upper edge of the shoe securing it to the stocking. Place a scrap of tissue paper underneath the fabric to help keep the fabric from puckering. 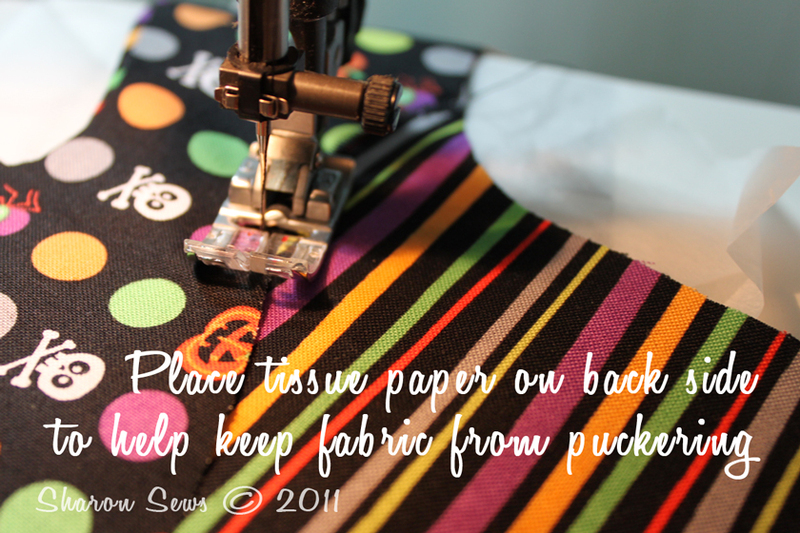 Tear away the tissue paper when you're done stitching. 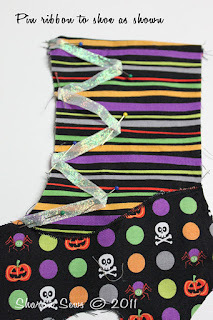 Machine or hand baste the curved lower edge of the shoe to the stocking. 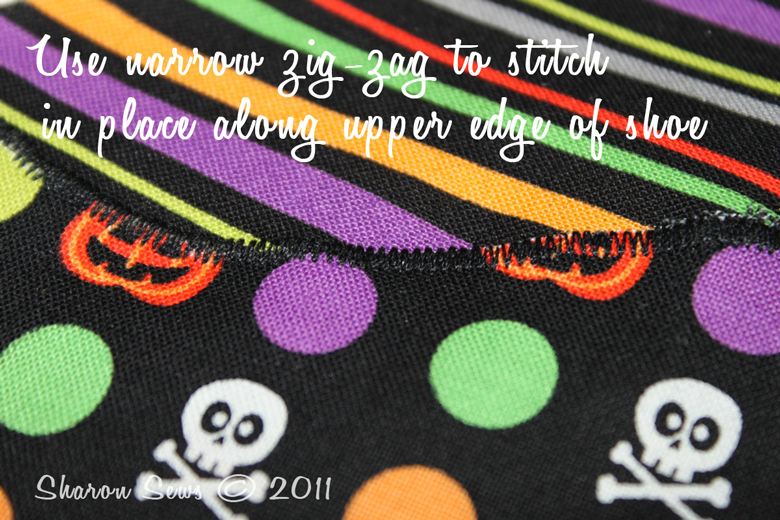 Stitch a 1/2" hem along the top edge of each stocking. 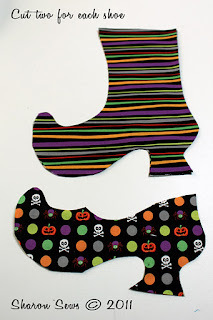 For each shoe holder, cut 2 pieces of ribbon 11" long. Pin ribbon to the shoe holder as shown in the photo below. 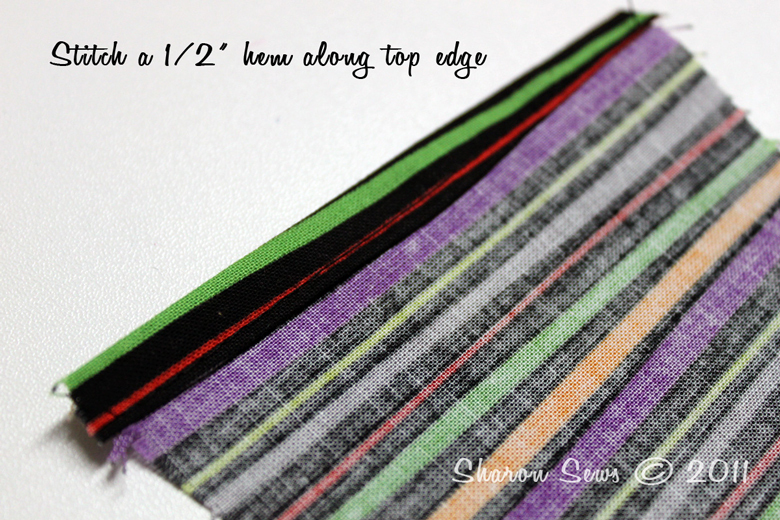 The measurement from the edge of the stocking to where the ribbon makes a "V" on the stocking is about 1-1/2". 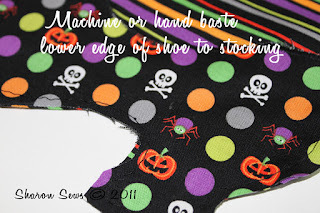 Hand or machine baste ribbon along edge of stocking. Hand tack or glue where the ribbon is a "V". 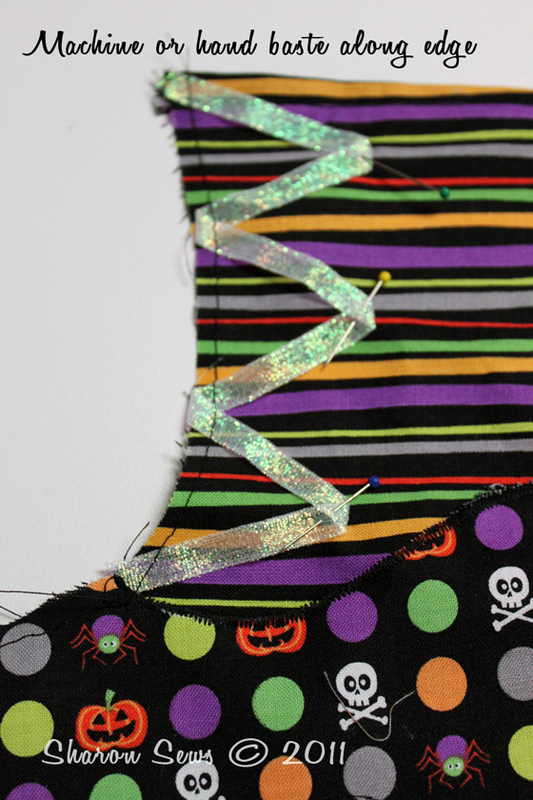 Sew buttons over ribbon as shown. Place each shoe right sides together. 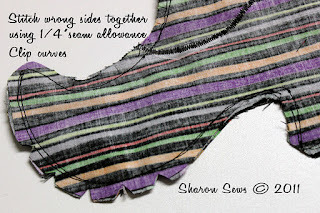 Stitch together using a 1/4" seam allowance. Carefully clip all of the curves. Turn right side out and press lightly. or use them as napkin or silveware holders to decorate your Halloween table. 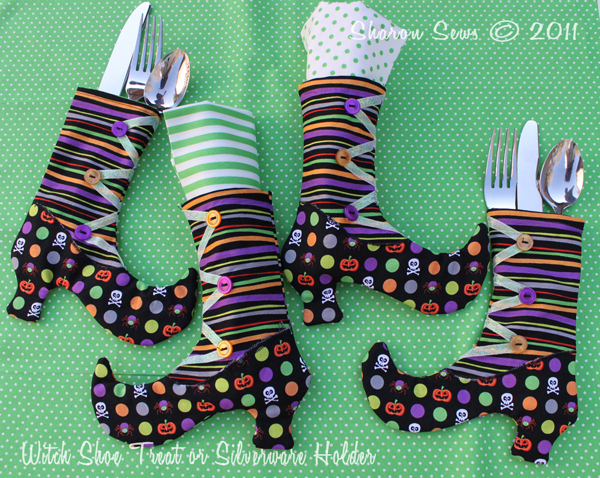 And yes, I got the idea from the mini-Christmas stocking silverware holders I made a few years ago (tutorial here). 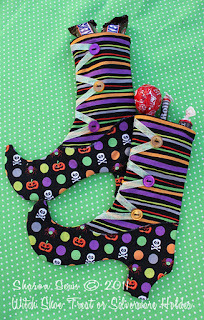 Those are so cute, and I really love the fabrics you used! 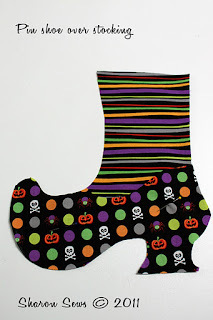 These are oh so cute! How cute is that! Oh, I wish I were having a Halloween party. They would be adorable little gifts. These are ADORABLE ! Thank you so much for the tutorial and template. These are so cute...I'll be sharing them with my daughter. She has her own home and she loves cute Halloween stuff. Thanks for visiting me today!! Hi, just thought you should know that this is the link that comes up instead of the empire line full bust adjustment tutorial. I can't seem to find the link for that separately. Great blog.And I really love the fabrics you used too. These were so cute that I made 2 of my own! Thanks for the inspiration! lovely...now to purchase Halloween fabric...Thank you! So cute. How many can you get out of a yard?